Income is not distributed evenly across California households. Across the state, some families can comfortably provide for their children’s needs and wants while other families struggle to provide basic clothing, food, and shelter. Some level of income inequality is expected, but when a portion of families cannot support their children’s basic needs, then it is a sign that income inequality has become too wide and poverty has become too deep. Kidsdata has added new measures of income inequality: Household Income Distribution, by Quintile and the Gini Index of Household Income Inequality, with data available by city, county, school district, and legislative district. The indicator, Household Income Distribution, ranks households by their level of income, divides them into five equally sized groups, then determines the share of aggregate income that each quintile receives, where 20% for each group would represent income equality. The Gini Index expresses income inequality on a scale of 0 and 1, where 0 represents income equality. How much of the pie do the highest earners get in California? 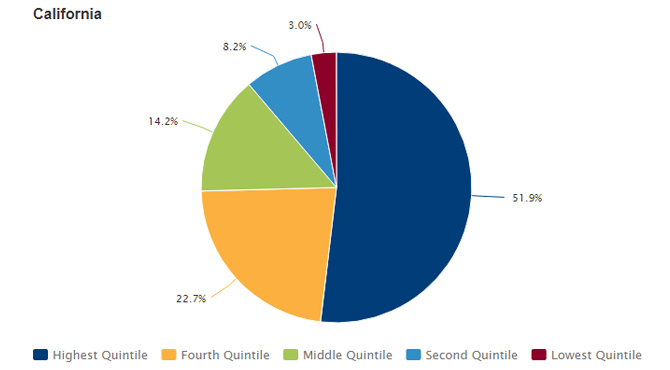 Those in the highest quintile earned an estimated 52% of all household income in 2017, compared with a 3% share of total income earned by households in the lowest quintile. Two counties (Marin and San Francisco Counties) with the highest level of income inequality in California, as measured by the Gini index, also have some of the highest family median annual incomes in the state, among counties with data in 2017. While some income inequality is inherent in the economic structure of our society, extreme disparity reflects social and political choices. Let us prioritize children by shaping policies and practices that ensure their basic needs are met so that they may reach their maximum health potential. Learn about Stockton’s approach to addressing income inequality with the country’s first-ever city-led Guaranteed Income initiative. The New Importance of Children in America argues that our standard of living and future economy demand that children become our highest priority. In addition to measures of income inequality, we have recently updated data on Early Care and Education. See links to the latest here. This entry was posted on Tuesday, April 16th, 2019 at 10:45 am. You can follow any responses to this entry through the RSS 2.0 feed. You can leave a response, or trackback from your own site.